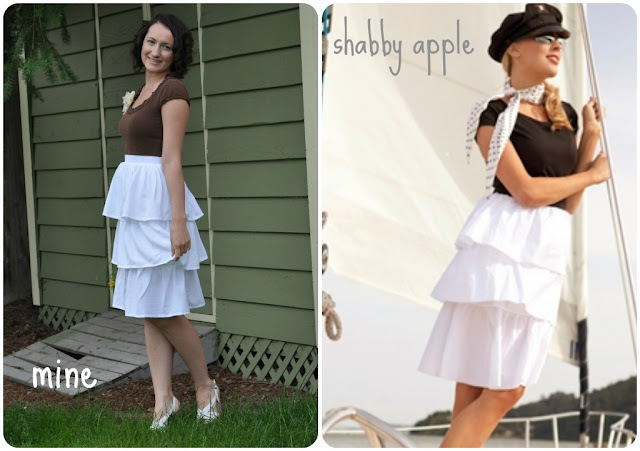 Ever since I saw the Starboard bow dress at shabby apple, I knew I could make one myself since I had a brown t-shirt I no longer wore (it was to short). Well, I gave it my best shot. Close enough, don't you think? My ruffles were 11" X 63"
my underskirt was 43"X 21"
First take the underskirt and sew the edges together and hem it. Next I got my ruffles all ready. oh my goodness that is super cute:) love it! This is PERFECT! I would never have known it wasn't the Shabby Apple dress...it's wonderful! I LOVE IT!!! You are so talented! And you look adorable! That is incredibly cute and chic. Great job!! Sooo cute! Thanks for the tutorial. This is SO perfect! Great job! WOW! That is amazing! Great work! Yours is totally cuter than the Shabby Apple dress. You are making me want to bust out the sewing machine! This is darling and I love that it is so close to the Shabby Apple dress! What a great recreate! So great - and I love the white! What a great dress! I love that you can repurpose a too short shirt and make an even cuter clothing item out of it. you are so ridiculously talented. I love it! This is fabulous! Great job on the dress. You and your daughter are so cute together! I love the dress, you did a great job! WOW Love it! I will have to save this for when I am not 6 months pregnant! Thank you! That is a really pretty dress. I like it. Good job. love love love! Seen you post this on several of the same linky parties I attend! Great job! YOu should be so proud!! Adorable! You made it look so simple!! And yes, you look gorgeous in it, what a great style for you (and your daughter is a cutie!). How cute you are! Love the dress! You are so creative and talented. Gorgeous. Pinning this one for sure! Gorgeous!!! Love it!!! I am visiting from J&M's Eye Candy and I am a new follower!! Hope you have a great week and I see you around my blog soon! Love it (and your other one too!) I will be featuring this on my blog tomorrow for Three Things Thursday (July 14). Drop on by, check it out, and grab a featured button if you like! That is super cute! Almost identical to the inspiration. Way to go! That looks almost exactly like the other one! I like yours the best! :) I am a new follower here and am excited to read your blog! I would be really honored if you were to link up next week at my Pajama Party! Ahhh... Shabby Apple, how I am inspired by thee! Thanks for sharing your beautiful recreation! I especially like the little ruffle around the neck of your dress! Thanks for sharing! Oh my goodness!!! You are so talented! I LOVE it!! And now I want to go sew! :D How did you determine the length of your skirt? That is always the part I mess up on and end up making my skirts too long, then I have to go back and re-hem! so not fun!! But, I love your dress!!! That is amazing!! Wonderful job! Great job!!! It looks so professional. Wow! The fact that you whipped this up without a pattern blows me away! WOW...just WOW! WOW!!! That's FANTASTIC!!! I want to go make one of these...or a few!!! I wish I didn't have to paint my kitchen now!! I REALLY love this!! Thanks sooo much for sharing and giving such great instructions!! :) I'm following you now! Cute, cute cute. Perfect. I saw that dress on shabby apple the other day and thought it would be a great knockoff dress to try! You did a fabulous job. The tutorial is very clear and direct. :) Pinning! Very cute. When you attached the shirt to the skirt, did you sew the shirt to the elastic or to the underskirt? If the elastic, were you able to fold the seam allowance down? I am picturing 1/2" of folded elastic to the inside at the waist and an imagining it's not that comfortable? Thanks! Love it, enjoy following u with GFC. Such a great dress, good work! Thanks for linking to Bacon Time. Hope to see you each week. Oh I just love this!!! Great job & great idea. Great tutorial and it looks beautiful! 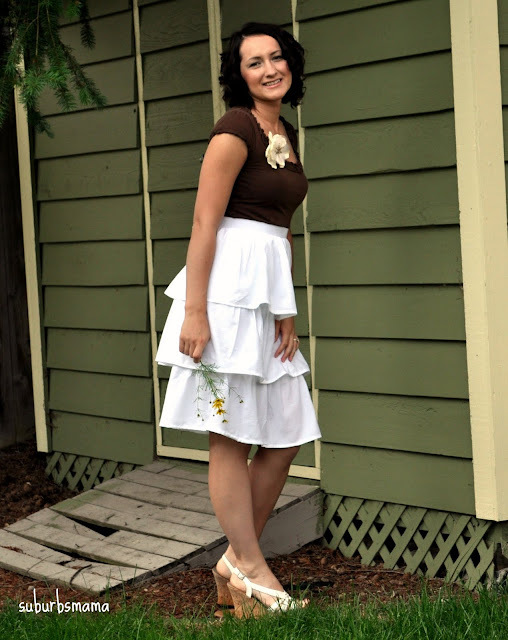 I've featured it on my blog at http://www.craftbuds.com/free-pattern-features-summer-dresses-winner/. Amazing! The dress is every bit as nice as the prototype. You look wonderful in it. Great job! I love your dress! It looks pretty easy too. Thanks for sharing! That looks amazing! I think yours has a better fit than the Shabby Apple version. Great idea! Very cute! Thanks for the how-to! I like yours so much better!! Thanks for the tutorial on how you did it!! Wow, it looks great. I want to try now ;) Thanks so much for sharing and linking up with us. Hope to see you again at our party! If I didn't see the "in progress" pictures, I would have sworn that you had purchased the Shabby Apple dress! You did such a fantastic job replicating that dress!!! And more importantly, it looks fabulous on you. I love it!! You look fabulous!!! Hoping to try and make this and hope I look as awesome as you!! Thanks for linking up to Strut Your Stuff Sundays on our blog! We appreciate it! Great job on the dress! Thank you for linking up to Sew Woodsy last week! You did a fabulous knock-off! I like your better than the original! Thank you so much for linking up with the frog last week! I hope you will join me again tomorrow!! Once again another amazing dress!!! You are so talented!!! I love it. Thanks for linking this up to our link party last week . . . we would love to have you stop by today and link up more of your great projects at Strut Your Stuff Saturday! I love this dress...and am in the process of making myself one. One thing I've learned...you need the patience of Job to ruffle a piece of fabric that long!! :) Someday I'll do it without breaking a thread...someday. I love it!!! What kind of fabric is the skirt?